My social media feeds are full of Thanksgiving food pictures and I’m loving that. I don’t think I can get tired of seeing pictures of all the pies. Mmm pies. Plus, I think it’s kind of fun to see what people make for their families, whether it be a rendition of a classic dish or something non-traditional, like tacos. 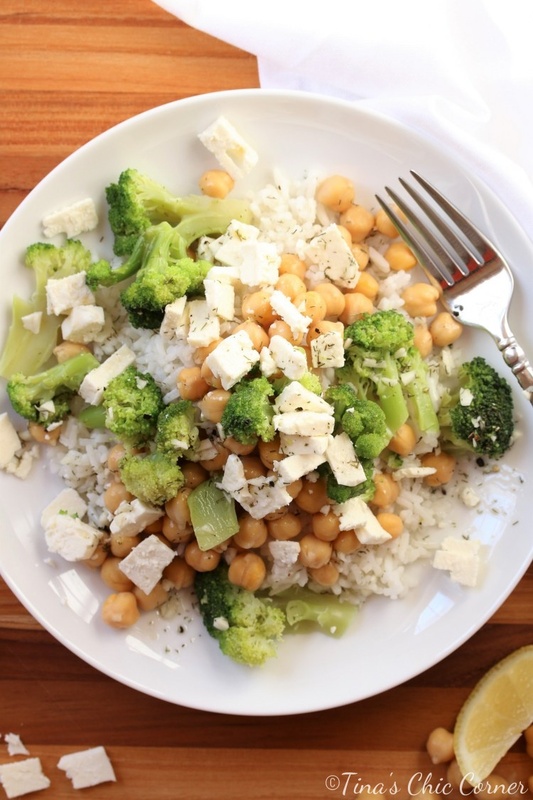 This meal is a good example of a lunch that I make ahead of time to bring to work. I start with the carbs like couscous, white or brown rice, or quinoa. Then I add the protein, like chick peas or chicken. Next I add a veggie of some sort. Sometimes I add a low fat cheese (because cheese makes everything better). Sometimes I add a dressing, like the lemon dressing I tell you how to make below. I love this stuff and I use it on so many things because it’s so delicious. My husband skipped the lemon dressing and simply seasoned the dish with salt and dill. He said that was lovely so if you’d like to go that route you have another option. We’re getting into the season when fresh produce is not easy to come by so I like to use frozen veggies. The frozen broccoli I bought came in a bag that you pop in the microwave to cook. 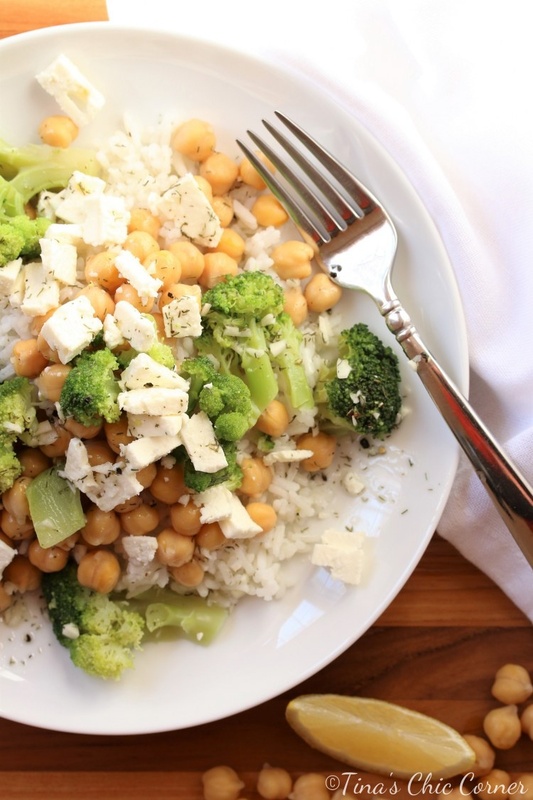 Whether you use frozen or fresh broccoli, feel free to cook it any way that you like it. Roast it, pan fry it, steam it on the stove top, or even raw will all work with this meal. Let’s get back to Thanksgiving foods because that’s probably more exciting than rice and beans. 😉 A Thanksgiving feast usually involves the classics, like turkey, mashed potatoes, green beans, pumpkin pie, and… you get the idea. When I was growing up, my Italian grandma always hosted the holidays and she served lasagna AND turkey with the classic side dishes for dinner. Lasagna was the first course and the main attraction because it was the yummiest thing ever. We’ll be spending Thanksgiving day with my family and my mom is making turkey with the classic sides. I can’t wait to eat all the yummy food! What are you guys eating for Thanksgiving dinner? In a medium bowl, whisk together the oil, lemon juice, minced garlic, pepper, salt, and dill. 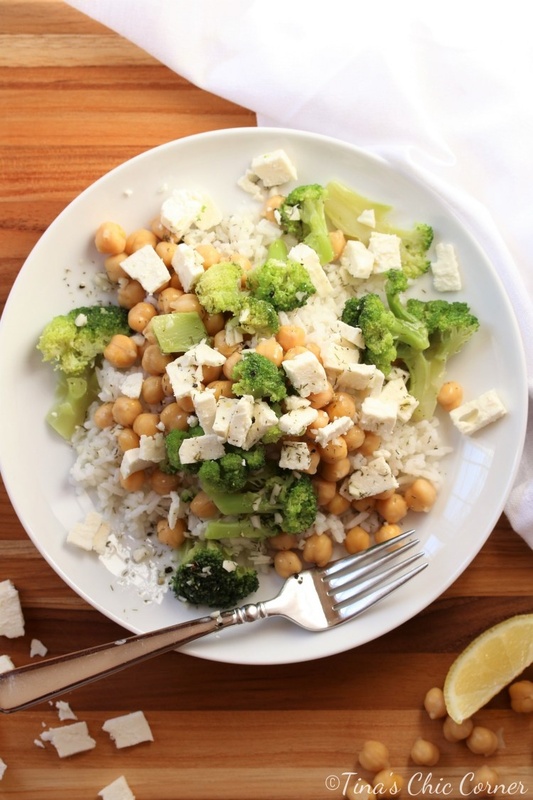 In a bowl, mix together the cooked rice, chick peas, chopped broccoli, feta cheese, and lemon dressing, then stir gently. I really like this! I’d make this for a dinner, also. I sometime don’t want to eat meat and this has it all. I think beans are a great substitute for meat. I’m glad you like it.